"He's back.... the most important and elusive writer of his generation returns with a magnificently crazy and compelling psychedelic yarn about the sixties, featuring new noir hero, private eye Doc Sportello." 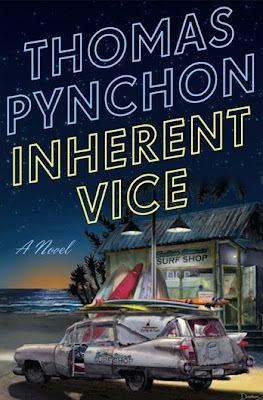 So reads the blurb on the back cover of 'Inherent Vice', the soon-to-be-published eighth novel by one of the greats of modern literature, Thomas Pynchon. The book is due out at the beginning of August, but don't expect the blurb to be accompanied by a picture of the author. A spectacular recluse, Pynchon has never appeared on TV or radio, and hasn't been photographed or interviewed since he began writing back in the early 1960's. 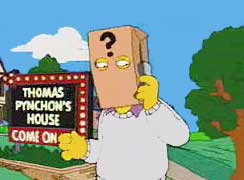 His only 'public' appearance since his debut novel 'V' came out in 1963 was as recent as 2004, in an episode of the Simpsons, where he lent his voice to his own character, but wore a paper bag on his head. Pynchon's fantastic imagination has a very visual quality to it, and his books tend to inspire other writers and artists. Gravity's Rainbow, for example, was recently reimagined as illustration by the artist Zak Smith, in his amazing 'Pictures Showing What Happens on Every Page of Thomas Pynchon's Gravity's Rainbow' - all 768 pages of it. The actual illustrations are on permanent display in the Whitney Museum of Modern Art in New York. But back to Inherent Vice. Based on the few reviews I've read, the new book is short by Pynchon's standards, at just over 400 pages, is set in a definite genre (noir fiction), and may well turn out to be his most accessible work yet. The new novel is ostensibly about a group of drifters and surfing stoneheads, caught up in a bizarre noir murder plot (think the Big Lebowski, but infused with Pynchon's trademark paranoia and overwritten virtuoso stylisations). And a quick glance at the coverart seems to confirm that description - surf artist Darshan Zenith's "Eternal Summer" - a 1959 Cadillac Hearse (in diecast metal) is parked in front of the Endless Summer Surf Shop, coupled with some brilliantly offbeat neon type in an italicised geometric sans serif (which looks a lot like Avenir). Pynchon's previous novels are regularly reissued, and there is a considerable back catalogue of inventive coverart spanning his output, and reflecting his themes of politics, paranoia, machinery and pop culture.